The Jarman Island Lighthouse was built to guide shipping into Cossack, which was the first Port to be established in the north west of the state and was the major North West Port by the late 1800's. Pearling was already an important industry and larger ships would bring in supplies for Marble Bar and Port Hedland. In turn, the pearling industry shifted to Broome and in 1904 a new jetty was built at Point Samson which became the new Port for the area. The prefabricated cast iron lighthouse was first built in 1887 by Chance Bros in Birmingham, England and shipped to Australia in parts. W.I. Owen, the Resident Engineer for the North West undertook responsibility for the construction of the tower using prison labour to build the tower and the Keepers Quarters. The Tower was completed on May 14 1888, with the first Lightkeeper S. Elford appointed on May16th 1888. Work on the Quarters commenced in the following year with only half of the proposed quarters built initially. Additions were made in 1895-96. From the photo below it is easy to see the different sections built from different stone, although in a similar style. The roof was constructed in concrete on a dome framework. 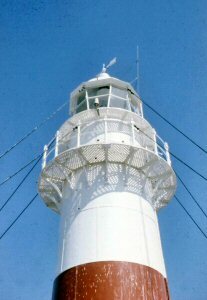 There is an excellent description on the Federal register of the National Estate site, re the importance of the innovative design technique of using pre fabricated cast iron towers and how it heralded a new era in lighthouse construction particularly in establishing lights in remote areas. Jarman Island is registered under the Heritage of Western Australia Act 1990 and was entered into the Federal Register of the National Estate and classified by the National Trust. The Department of Land Information, Heritage Council of WA, National Trust of Australia, Pilbara Development Commission, LandCorp and the Shire of Roebourne are now working in unison to breathe new life into the settlement. Cossack buildings are already refurbished and being used in a variety of ways. 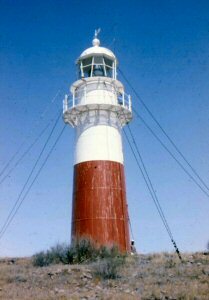 It will be exciting to see the Jarman Island Lighthouse come back to life under the care of the Shire of Roebourne.